The WordPress content management system in its basic form has – unlike Drupal, for example – no instruments for visitor monitoring, such as different access analyses, monitoring of links from which the visitors came, search analysis and the like. However, it is no problem to implement these functions using a quality module called StatPress Seolution. 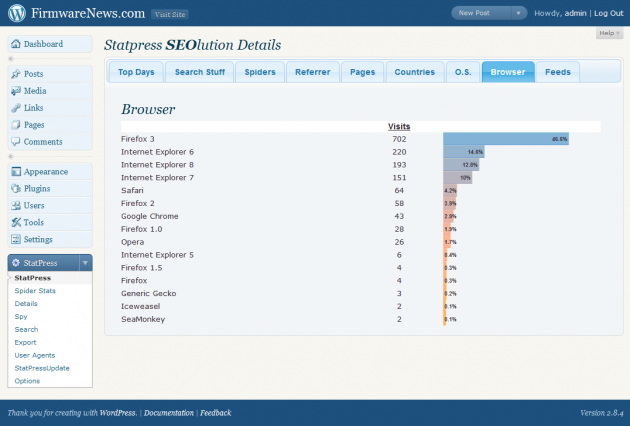 The StatPress Seolution module is based on the StatPress module that is supplemented by a series of useful Flash graphs. The installation is simple and usual, not even the less experienced WordPress users should have problems with it. After the installation, the StatPress Seolution creates an independent section called StatPress in the administration part of WordPress, where you will find links to different graphs. Each of the sections that StatPress Seolution offers under the drop-down menu in the left panel is further divided into several bookmarks in the main part of the administration interface desktop. In the general overview you can see several graphs with a number-of-visits overview, number of visitors, development in the number of viewed pages or number of visits of the web’s RSS sources in the first bookmark. Other bookmarks offer an overview of last visits, a list of keyword used to find the site, a list of link pages, a list of agents (browsers, search engine robots - spiders) and a list of last viewed pages on your web. Basic data described above can be found directly under the StatPress link. 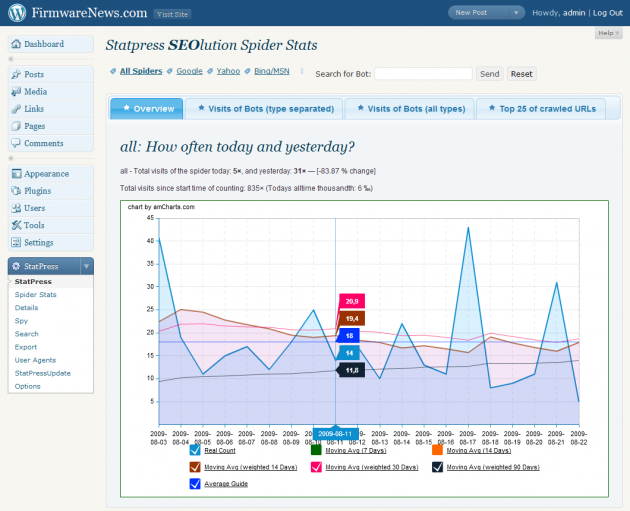 Right under it there is an interesting statistic with an overview of search engine robots (spiders) visiting your web. In the first part you will find a graph with spiders overview, further there is a table dividing them according to type, a list of all bots and an overview of 25 most frequently checked pages. Although I don’t spend too much time reading the statistics of my webs that run on the WordPress platform (there is several of them), I was captured by the detailed view of different data. The StatPress Seolution offers „the best days“ according to the number of visits, viewed pages and other parameters, lists of top browsers and searched keywords and much more. Of course you will also learn the versions of browsers that people use to visit your web. No special function is hidden under the Spy link. It simply shows last visits along with information about the link that the visitor used to come to your web, his or her IP address (not even the flag of the respective state is missing), the pages that he or she visited and the page he or she left from. Even this data can be used to improve your website. All information that the StatPress Seolution module collects can be searched using a special interface under the Search item. If you prefer working with Excel where you can filter just the data that you need, then you can export the saved statistics into a CSV file. It does not pose a problem for StatPress Seolution and what is more, you can choose from several separators of the exported items and from different time frames. In accordance with your WordPress web settings, you can enable collecting information about logged users. I don’t use this setting, because my WordPress managed web sites are used purely as blogs into which no other users except for the author need to log in. Collecting information about bots can also be disabled to lower the amount of records in the database. In my opinion, StatPress Seolution is a useful tool that fills the void in the basic WordPress module statistics. 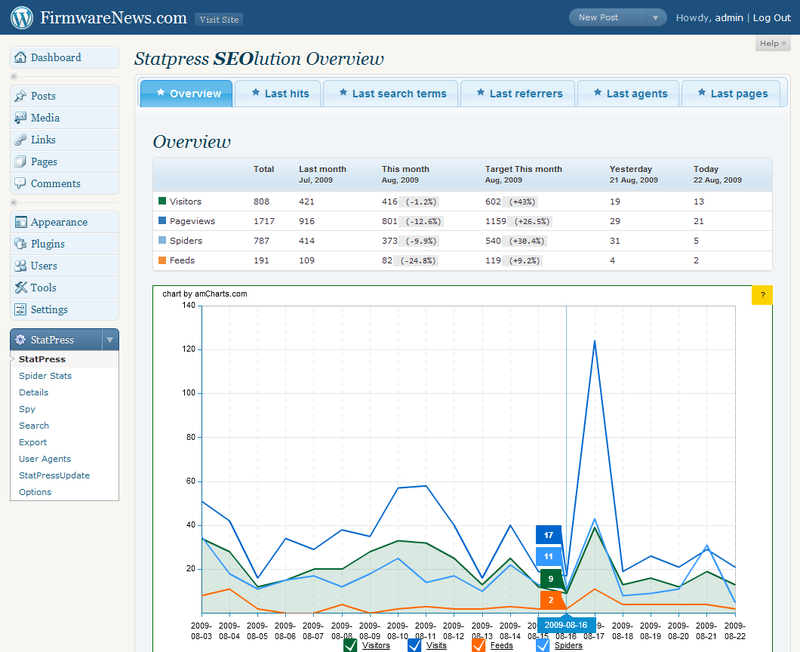 If you don’t use Google Analytics or if you need something to compare its results with, the StatPress Seolution is a suitable solution for you. The plug-in can be installed directly from the administration section of your WordPress managed website.